You Asked, We Listened: Dunkin’ K-Cup® Portion Packs Have ArriveDD at Participating U.S. Dunkin’ Donuts Restaurants! It doesn’t seem that long ago when we exciteDDly announced our plans to bring Dunkin’ K-Cup® portion packs to participating U.S. Dunkin’ Donuts restuarants. Following the announcement, we couldn’t have been more thrilled to see the wave of positive responses from tweets to @DunkinDonuts on Twitter and posts on our Facebook Wall. It was clear that DD fans and Keurig enthusiasts wanted their Dunkin’ K-Cup® portion packs and they wanted them now! Well, no longer will DD fans have to ask when Dunkin’ K-Cup® portion packs are coming! Dunkin’ K-Cup® portion packs have arriveDD at participating U.S. Dunkin’ Donuts restaurants in 14-count boxes. They’re available in five popular Dunkin’ Donuts flavors, including Original Blend, Dunkin’ Decaf®, French Vanilla, Hazelnut and Dunkin’ Dark® Roast, and are made the same great-tasting Dunkin’ Donuts ground coffee served inside our restaurants. 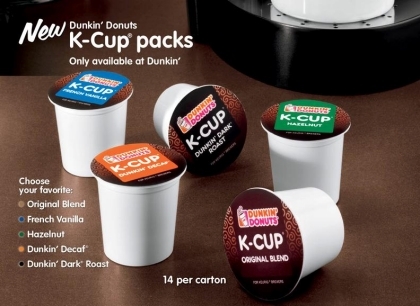 Dunkin K-Cup portion packs are recommendeDD for use with Keurig® Single-Cup brewers. Keurig®’s Single-Cup brewers for in-home and office utilize patented, innovative brewing and single-cup technology to deliver a fresh-brewed, perfect cup of coffee, tea, hot cocoa or other specialty beverages every time at just the touch of a button. Interested in purchasing Dunkin’ K-Cup® portion packs? 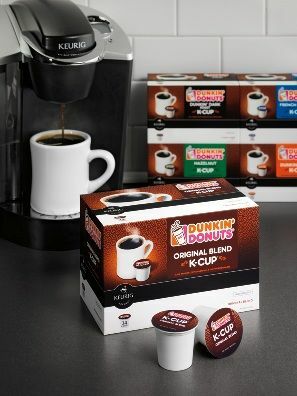 Starting today, you can see which DD’s are selling them by looking for the Dunkin’ K-Cup® portion packs icon in our restaurant locator: http://www.dunkindonuts.com/content/dunkindonuts/en/stores.html. For more information on Dunkin’ K-Cup® portion packs, please visit our website.